Xeoma offers a variety of remote access options to establish remote connection of various types and for various purposes – client-server connection, multi-server connection, “Web server”-“Another Xeoma” pair of modules, and browser remote view. Let’s get deeper into what they are for and how to use them. Used to: view all cameras, access (view and change) settings for cameras and other modules, view real-time and recorded footage. How to: Run / install Xeoma CCTV security on machine #1 and use this computer’s external IP address, available from the Internet, to connect to the machine #1 from other machines – their total number is not limited. Just run Xeoma on those other machines (they can be under an OS other than machine #1’s), go to Remote Access menu and specify machine #1’s IP and password. 2) Multi-server connection. This is just another type of client-server connection for remote access. Used to: remote view of cameras in real-time and archive recordings from several Xeomas at the same time. 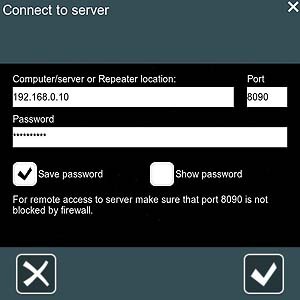 How to: In Remote Access menu choose Multi-Server Mode, add some of Xeoma servers that you want to view cameras from and have access (password) to. Used to: remote view of a certain camera of machine #1 in real-time and record footage from this camera onto machines other than machine #1. How to: Run Xeoma on machine #1, connect “Webserver” module to a camera and set the module up. On another machine run Xeoma and use not a universal camera but “Another Xeoma” as a source. In settings of the module you need to specify machine #1’s available from the Internet IP address and stream info. *you will need as many “Webserver”-“Another Xeoma” junctions as cameras you want to see. 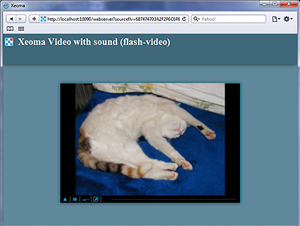 Used to: view a certain camera in real-time in a web browser, for example through mobile devices. How to: Run Xeoma on machine #1, connect “Webserver” module to the camera and set the module up. In the module’s settings you will find a link to paste into web browser. *you will need as many “Webserver” modules as cameras that you want to view in a browser.